Interview: Omid Memarian, Editor Of 'Sketches Of Iran' Political cartoons have a long history in Iran and give voice to critics of the authoritarian regime. Lately cartoonists have been increasingly persecuted for their work. A recent book, Sketches of Iran, pairs 40 political essays with cartoons depicting life in Iran today. 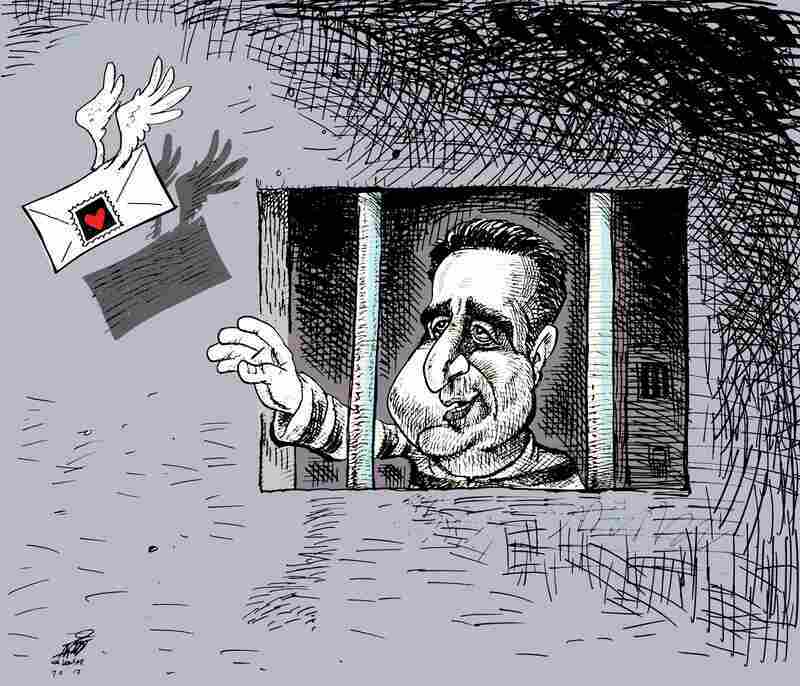 "Mostafa Tajzadeh" by Nikahang Kowsar: After Iran's 2009 elections, Tajzadeh was arrested and sentenced to six years in prison. His charges included "propaganda against the regime." 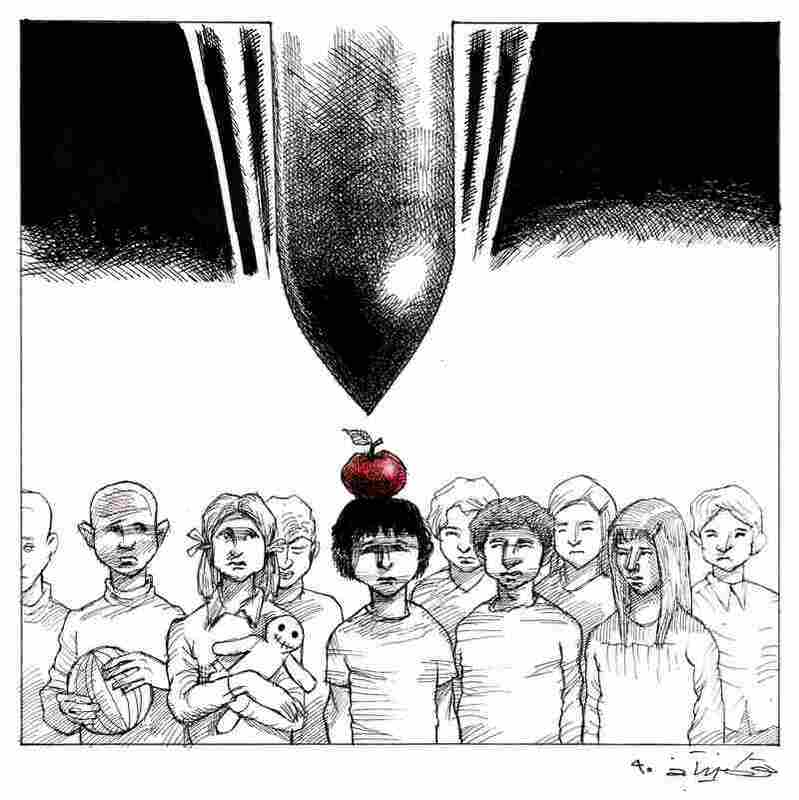 "War" by Touka Neyestani: Neyestani received a degree in architecture from Tehran's Science and Industry University, and has been a cartoonist for more than 30 years. "House Arrest" by Nikahang Kowsar: Mir Hossein Mousavi, a presidential candidate in the disputed 2009 presidential election, and his wife have been under house arrest with no charge brought against them, since early 2011. 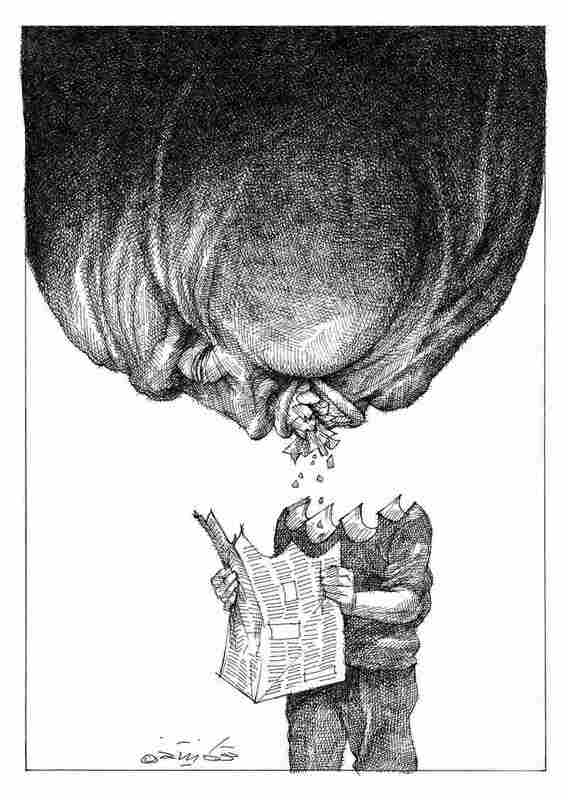 This Touka Neyestani cartoon, "Media and Power," appears in Sketches of Iran alongside an essay by Iranian journalist Nooshabeh Amiri. Amiri writes about the perils of reporting under Ayatollah Khomeini in the late '70s. 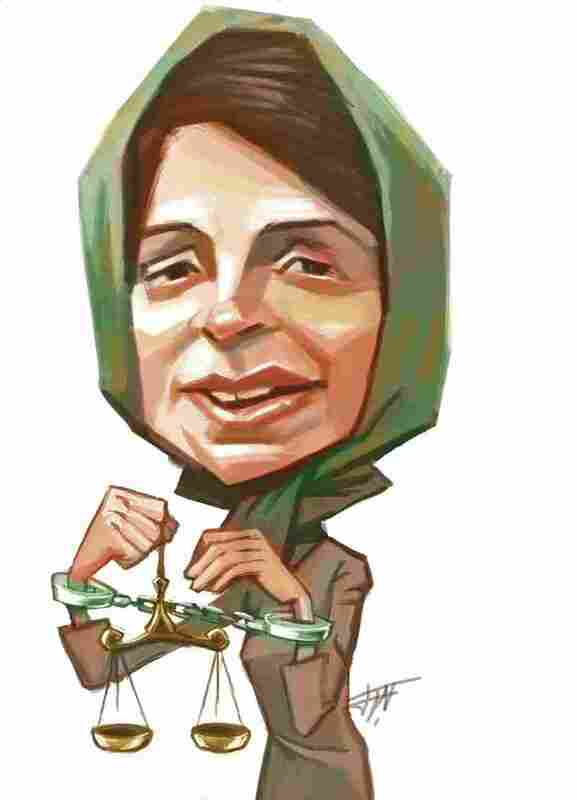 "Nasrin Sotoudeh" by Afshin Sabouki: Sotoudeh is an Iranian human rights lawyer and an advocate for women, children and prisoners of conscience. She is serving a six-year sentence for charges including "membership in the Defenders of Human Rights Center." 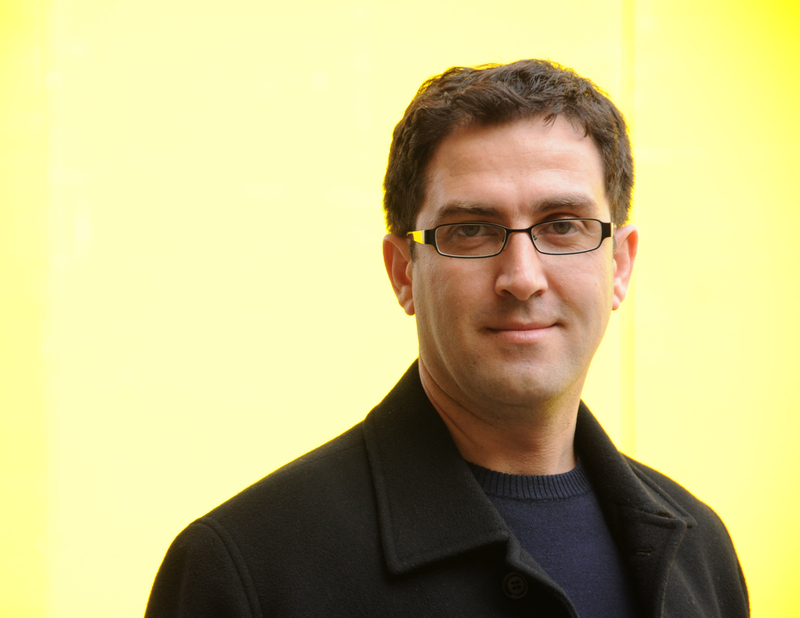 Omid Memarian is an Iranian journalist who moved to the U.S. in 2005. 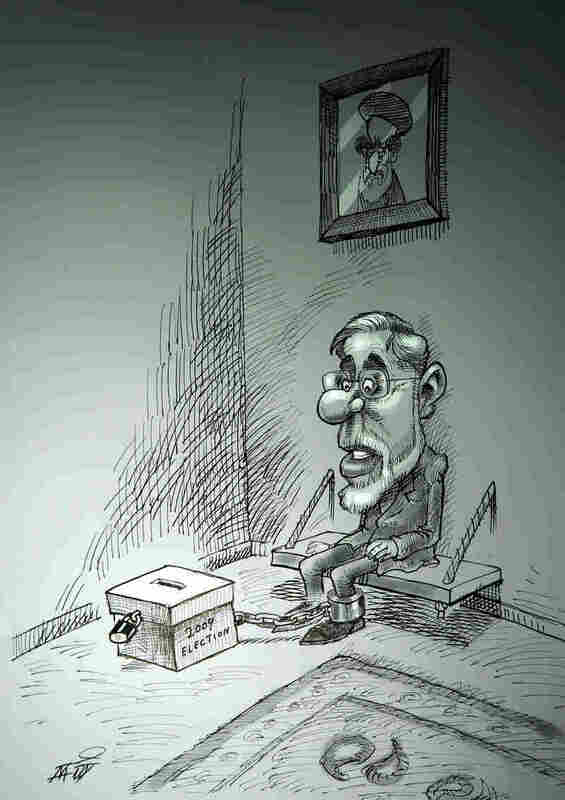 Iranian newspapers are rife with cartoons. They are a tradition, and play a big role voicing criticism of the country's authoritarian regime. 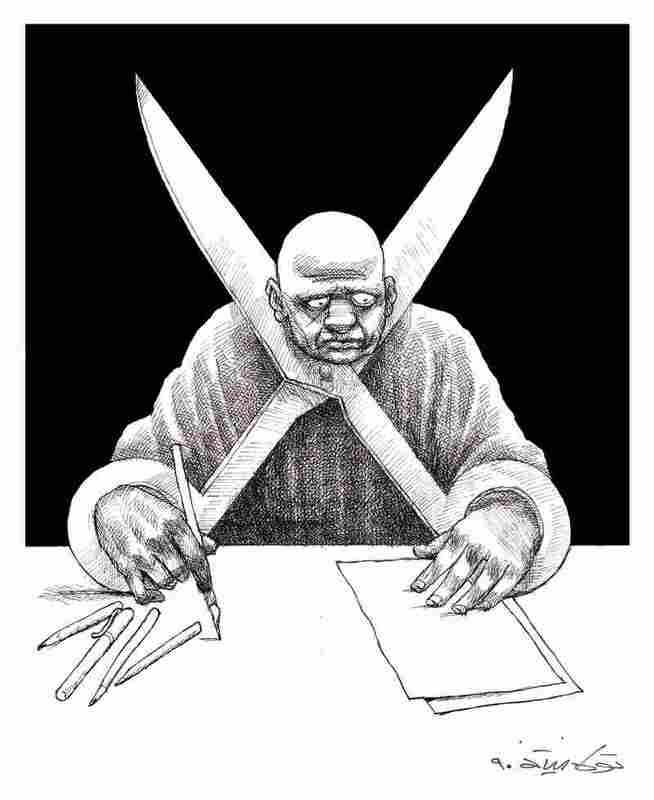 Increasingly, though, Iranian cartoonists have been imprisoned, received death threats, or gone into exile because of their work. 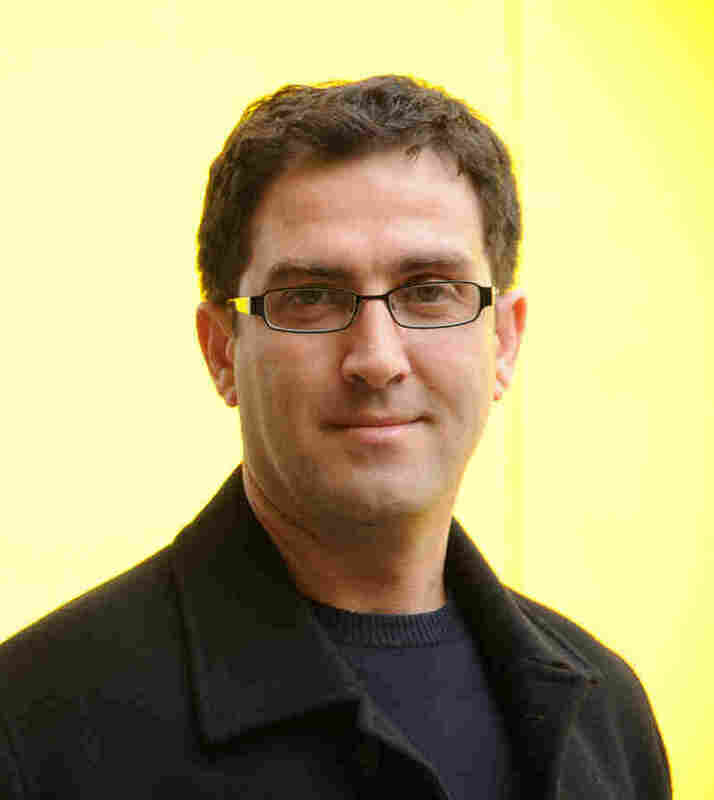 Omid Memarian was a journalist in Iran. Arrested in 2004 for his writing, he was taken to prison, tortured and forced into a confession of guilt on national television. He fled to the United States in 2005, attended graduate school for journalism at the University of California, Berkeley, and continued to work as a journalist. Now he's edited a book published by the International Campaign for Human Rights in Iran. 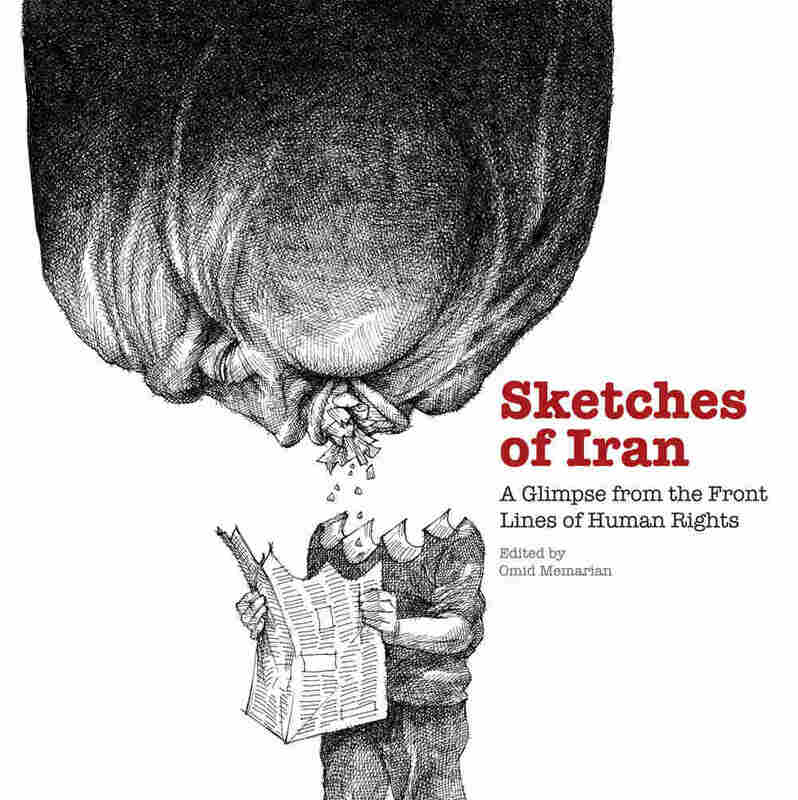 Sketches of Iran: A Glimpse from the Front Lines of Human Rights consists of 40 essays of political persecution paired with political cartoons from artists inside and outside Iran. Memarian joined Jacki Lyden, host of weekends on All Things Considered, to talk about the role of political cartoons in his home country. "It's a tradition in the Iranian media that each magazine, each newspaper, has a political cartoon, a bunch of political cartons every single day. ... Newspapers basically fight to have the best cartoonists for their newspapers." "I can write something and my audience is limited, but people from different ages and different social economic classes, they can understand the meaning of a cartoon. ... So I think in many ways cartoons are the best way to tell people a story." "Many cartoonists in Iran have been arrested for the cartoons that they have drawn for newspapers, and the reason is because the Iranian government knows the power and influence of political cartoons. And for that, many political cartoonists have tried to become ambiguous and communicate a message in a way that it makes it hard for the government to come after them. ... After the election [in 2009], we saw a intense crackdown against journalists, civil society activists, lawyers."